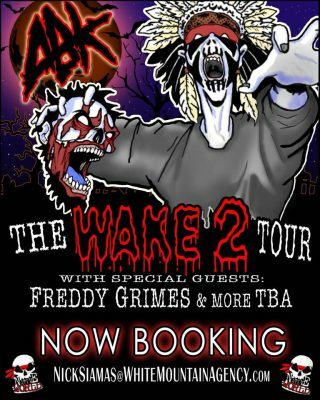 It looks like Anybody Killa is all setup to embark on his next stint on the road which will be called The Wake 2 Tour! Currently, Freddy Grimes is listed to be the supporting act, and more will be announced soon! It also looks like Killa has enlisted a new booking agent to set this tour up. If you’re a promoter looking to get this tour in your town, shoot an email to NickSiamas@WhiteMountainAgency.com to work out the details! On a side note, White Mountain Agency has booked tours for such clients as Rittz, Too $hort, Esham, Juicy J, Twista, and a ton of others! Take a look at the agency’s website at WhiteMountainAgency.com!